Address 1 Georgia Dome Drive, N.W. Stadium Financing State donated land; Authority issued industrial revenue bonds. "The Georgia Dome, not the worst-to-first Braves or the 1996 Olympics, began to transform Atlanta's professional sports image from Loserville USA to Big League - and when you see the Dome, it's easy to understand why. The Falcons have one of the best venues in the NFL, suitable to host the Super Bowl. Built especially for football, the Dome sparkles and draws applause even from the pundits who said they'd never root for a team in, or even go inside, an enclosed stadium. Unlike most other domes, this one doesn't resemble an erector set. Atlanta's indoor play-ground has a billoway roof and attractive teal colors on the outside; 150 tree's dot the property and mammoth windows allow natural light to fill the interior walkways. It gets even better inside. Seats, even in the upper-deck corners, are angled so spectators can see the field without having to turn their bodies, and the roof is supported with cables, so no pillars obstruct the view. When the Falcons are on and the run-and-shoot is carving up defenses, the Gerogia Dome can be an electric place. Music blares and a 300-pound break-dancer in the east end zone revs up his engine and gyrates." The largest cable-supported domed stadium in the world and the home of the Atlanta Falcons is open for tours. Tours include the locker rooms, Astroturf storage room, the press box and executive suites. 10 a.m.- 4 p.m., Tuesday through Saturday; Noon - 4 p.m. Sundays. Tour schedule subject to change to accommodate Dome Events. One Georgia Dome Drive, (404) 223-TOUR or 223-8687. * The Dome rises to a height of 275 feet from the center of the playing field to the roof center -- taller than the "Great Gasp" at Six Flags over Georgia. * A pair of C-5 transport planes could fit onto the Georgia Dome floor, which contains 102,000 square feet of exhibition space. * The dome's Teflon-coated Fiberglas fabric roof weighs just 68 pounds, but it is strong enough to support a fully loaded pickup truck. * The dome contains 110,000 cubic yards of concrete, enough to build a sidewalk from Atlanta to Cininnati. December 5, 1999 & November 14, 2004 - Visiting Atlanta means coming to a world class city, and the sheer size and vitality of this community can be instantly felt when coming upon the Georgia World Congress Center, a large convention complex which includes the Georgia Dome. Since its opening in 1991, this venue has become a major player in hosting many of the world's most prestigious sporting events. As this building goes into its decade of existence it has been witness to several key events of an Olympic Games, two Super Bowls, many SEC Championship football games, the SEC and ACC basketball tournaments, and so much more. Now wonder that on both of our visits, we left the venue with favorable impressions. The Georgia Dome is located on the west side of downtown Atlanta, and be accessed off of I-20 which runs east and west, or I-75 traveling north and south. Once on downtown streets, directions are not too well marked but just head west towards Centennial Park and you can't help but find it. Most of the surface parking lots east of the venue are reserved for season ticket holders, meaning permit required. But there are plenty of private lots scattered throughout downtown but that means a good 15 minute walk to the stadium. $15 seems to be the norm for private lots. Better yet, the best way to get here is to take public transportation. The MARTA rail line runs in all four directions around the city and many stations have free park and ride lots. Go to station W-1 and you are steps from the front door of the stadium, with no traffic or parking hassles. In addition to the World Congress Center, Phillips Arena and the CNN Center is also right next door and just beyond that is Centennial Park. Downtown Atlanta is pretty clean and safe and bustling. The reserved lots are pretty hopping as far as tailgating is concerned, but the occasional visitor might have a hard time finding a good place to set up a tailgate party. No matter! The team has set up a neat pre and post game party area outside the Dome called "Falcons Landing", complete with live music, cheerleaders and mascots, plenty of games and concessions and much more. All this in the shadow of a sleek and modern stadium - wine red and tan brick colored facade with smoked glass atrium style entrances at each corner. This facility seats over 71,000 for Falcons games and is split into the three level setup commonly found in the newer facilities we have visited. A lower level, a club level with suites and an upper level. The roof here is a major break from the older domes that are supported by air pressure. This roof here is made of teflon and supported by cables. The seating area is rather bright with the dominant seating color being teal, being the home of the Falcons we would have preferred it to be black but we suppose you can't have everything. There are small jumbotron video boards dispalyed on the second level of each endzone and numerous ribbon boards and dot matrix boards are scattered along the balcony rim. Large ad billboards are displayed on the wall above the uppermost seats. The concourses are decent and wide for the most part yet could use some color. The 100 level concourse has a view of the playing field, and an "outer concourse" includes a system of ramps and escalators to move fans from level to level. A lot of effort has been made here to upgrade concession offerings. Food items here consist of the usual football fanfare and being in Atlanta Coca-Cola is the beverage of choice. One specialty stand offers Cuban sandwiches and a meat concoction called "Mojo Sandwiches", and Barbecue sandwich stands are located everywhere. There is no main "team store" here, but plenty of small souvenir stands to get that Falcons merchandise you are just craving for!!! The idea of club seats came after this building opened, but here on the 200 level is a carpeted private concourse, with "executive lounges" at the north and south ends of the building, and also a restaurant called "In Zone" overlooking the east end zone and serving a buffet, dessert cart and themed menus. Two levels of suites ring the 200 level of the building, and there is also a "penthouse" part suite located on the 50 yard line at the very top of the seating bowl. The Falcons have had a mediocre existence since joining the NFL as an expansion team in 1966 as there are only two banners to celebrate here. One commemorating the 1980 NFC West Champions and the other to celebrate the 1998 NFC Champions. Their crowning moment was one trip to the Super Bowl, which they lost. A more recent addition is a "Ring of Honor", essentially banners of retired numbers which hang in each corner of the seating bowl way on high. The four honorees include #60 Tommy Nobis, #58 Jessie Tuggle, #31 William Andrews and #10 Steve Bartkowski. Extra Point - On our first visit, the Falcons and Saints headed into this game far removed from post season contention. However, there was quite a decent crowd on hand for this one. Considering that football is king in the South and that the Falcons and Saints are the two oldest franchises in the region, these two teams have one of the most underrated rivalries in the NFL and the building had about 25% Saints fans in attendance. The Falcons pummeled the Saints 35-13 that day making Atlanta teams 3 for 3 during our stay. On our return visit, it was the Michael Vick show as the streaking Falcons were all over the visiting Tampa Bay Bucs by a 24-14 score. Extra Point - We checked out the "SEC Experience" going on next door in the Convention Center. Andrew and Peter both tried their proficiency at kicking field goals. Needless to say, the NFL place kickers community can sleep soundly! Fumble - it is the building's best kept secret. We never knew it was there until after we got back home. Fumble - not one but TWO travel disasters for the USRT on our second visit here. We praised MARTA as a good way to go to the game, but when we rode the train back to our park n ride lot after the game, our train broke down, and a packed car of people had to wait for a new train. Then that train had mechanical difficulties, compounding our delay again. We get to the airport, and our &^$*(^%# Airtran flight is delayed, although most other flights were OK on a clear day. We finally got out of there around 11 pm for a flight that was scheduled to depart at 7:15. Aaaargghhh! What is cool about the Georgia Dome is its great location, right near the center of a very hopping downtown Atlanta. Plenty of things to do before and after the game, and a fairly decent tailgate scene. The building is architecturally stunning, and pretty modern for a venue which is going on 15 years. Best of all, the positive turnaround in the team's fortunes has revived full and energetic crowds in this place. Overall a pretty decent NFL experience, and a great city to come visit again and again. Atlanta, Ga. - In the future, the Atlanta Falcons could play in a new Georgia Dome south of its current home while the front door to the Georgia World Congress Center would move to Marietta Street in a giant new building. And conventioneers, who bring millions to Atlanta's coffers every year, would get around the convention center on airport-like moving sidewalks or trams. Those are just some of the ideas unveiled in a master plan for the downtown Georgia World Congress Center campus, which encompasses the convention facility, Dome and nearby Centennial Olympic Park. GWCC officials are looking at ways to expand the massive campus to stay competitive with other cities that are building newer and larger football stadiums and convention centers. Khalil Johnson, GWCC chief operating officer, offered no price tag for the ideas and said there is no timetable for when any, if accepted, would be implemented. Any plans would need approval from the GWCC Authority, the governing board. 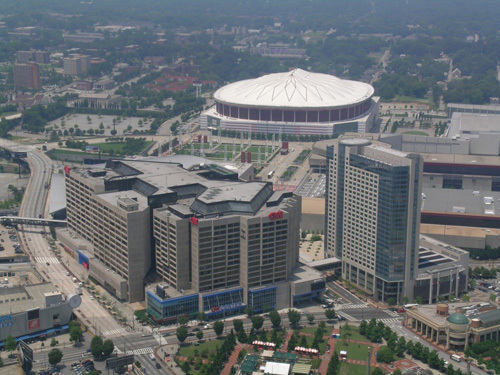 The convention center, Dome and Centennial Olympic Park are state-owned and operated. Whatever is done, it will be a necessary move. The Dome, which is just 16 years old, is older than 20 of the National Football League's more than 30 stadiums. The NFL has increasingly awarded Super Bowls to cities that have newer stadiums. Falcons owner Arthur Blank has said he wants a new stadium when the bonds issued to build the Dome are retired, around 2015 to 2020. When it was built in 1992, the Georgia Dome cost $214 million. But the cost of building a new stadium is now much more expensive. The Dallas Cowboys' new stadium cost about $1 billion, while the New York Jets and New York Giants will play in a $1.3 billion stadium, now under construction. HOK Sport, a Kansas City, Mo.-based firm known for its work with NFL teams, helped create the GWCC's master plan. The company said it saw ways for the facility to better use its footprint to attract business by improving landscaping on its border streets, making the campus more walkable and creating greater areas of greenspace. The company laid out several alternative plans for the GWCC, which generally centered around expanding or moving the Dome and increasing the size of the convention center. Each configuration used some of the GWCC's existing 44 acres of undeveloped space, including parking lots and pre-function or staging areas, for the expansion. That growth also could come from expanding the current Georgia Dome, which has seen several renovations recently, including a new paint job, For example, one plan calls for building new floors atop the Congress Center, making it a vertical as well as a horizontal giant. Atlanta, Ga. - Despite the Atlanta Falcons' winning ways, the Georgia Dome is facing tough economic times. Operators had anticipated profit of $20.2 million in October, but actually made $1 million less. The reason: a $1 million-plus shortfall in the sale of suite licenses, Georgia World Congress Center Director Dan Graveline told the GWCC Authority board. The GWCC operates the dome, the GWCC convention center and Centennial Olympic Park. Atlanta, Ga. - A developer is pitching the site of the closed GM plant in Doraville as a new home for the Atlanta Falcons. The Sembler Co., in a proposal to the Doraville City Council, suggests a retractable-roof stadium on 90 acres of the site. The rest of the site would be used for restaurants, condos and hotels. Falcons President Rich McKay said the team has been contacted by Sembler, according to the report, but added that the team will wait until GM decides who will get the property before going any further. GM recently said it has narrowed discussions about selling the site to one potential buyer, but it would not identify the company, and Sembler declined to comment. The Falcons now play in the recently remodeled Georgia Dome and have a lease through 2020. But owner Arthur Blank has said he'd like a new stadium, possibly before then. Doraville Mayor Ray Jenkins said the auto plant site would be a good spot for a stadium. "This location is so prime to everything," Jenkins says. "No matter what goes in there. Mixed use. Stadium. Whatever." Doraville's city council plans a "town hall style special meeting" in January to get citizen opinions on redevelopment plans for the site, according to the city Web site. But there is no mention of a proposal involving the Falcons. A new home for the Atlanta Falcons could be in the works for the shuttered General Motors assembly plant in Doraville, according to city documents. The Sembler Co., one of four bidders for the site and said to be the lone finalist, is listed in a September memo to Doraville City Council as considering a retractable-roof dome. According to a Sept. 9 city memo, Jeffrey Fuqua, the president of Florida-based Sembler, told city officials his company would propose a 90-acre retractable-roof dome with a price tag of nearly $1 billion. The remaining land would be developed as a mixed-use community similar to its Town Brookhaven development. Or plans might involve just a mixed-use development. The state agency that owns and operates the current home of the Falcons isn't saying much about reports that a stadium for the team could be in the works at the site of a shuttered auto plant in Doraville. Dan Graveline, the executive director of the Georgia World Congress Center, which owns and operates the Georgia Dome, declined to speculate about a report that a retractable-roof dome could be part of a developer's plans for the closed plant along Interstate 85. "We have heard rumors of such a proposal, but no plan has been presented to us by the Atlanta Falcons," Graveline said in e-mail. "We cannot speculate on details until something more concrete is determined." The Falcons have a lease to play in the recently upgraded Georgia Dome through 2020. Falcons owner and CEO Arthur Blank has said publicly that he would like a new stadium. Rumors of a stadium at the Doraville site have surfaced since GM announced in 2006 it would close the plant. Doraville Mayor Ray Jenkins said in a telephone interview that General Motors has not picked a bidder and that no official plans have been made. "I'm kindly saying whenever GM decides who it is that's when the city of Doraville will talk to them," Jenkins said. The economy and tightening credit markets have slowed negotiations, Jenkins said. "�Until then it's a complete standstill." Earlier this month, officials with the Georgia World Congress Center Authority unveiled a master plan to expand the nation's fourth-largest convention center and renovate or build a new home for the Falcons. Atlanta, Ga. - Despite a winning season and a trip to the playoffs, the Atlanta Falcons are taking longer to sell the hundreds of vacant suites and club seats for the coming year. Georgia Dome and Falcons officials blamed the economy. "We probably have more unsold inventory than we've had in the last five years," Rich McKay, president of the Falcons, said at a meeting of the Georgia World Congress Center Authority, which oversees the Dome. Falcons managers said the seats are selling, but much slower than usual. Revenue at the Dome is off about $2 million for the fiscal year - which began July 1, 2008 - mostly because of slow sales of suites and seats, Dan Graveline, executive director of the Georgia World Congress Center, said at the meeting. Dave Cohen, vice president of sales and service for the Falcons, said there are dozens of suites available. Of the 5,400 club seats at the Dome, 1,000 are still for sale. He expects to sell at least 950 of them. He said while the economy has made it tougher to move inventory, about 70 percent of the Dome's preferred seating - suites and club seats - has been sold. Cohen said the team projects 2009 revenue from suites and seats at around $20.7 million, $1.2 million less than they expected. Atlanta, Ga. - The Atlanta Falcons are looking at possible stadium sites throughout the Atlanta area, although owner Arthur Blank hopes to find a downtown location. The possibility of a new Dome was included in a master plan announced late last year by the Georgia World Congress Center Authority. The Falcons are in the lower fourth of the National Football League in revenue. Blank wants a better lease and more management control from the Authority or a new stadium where they control all or most of the management. The lease expires when the bonds sold to build the Dome are paid, which could be as early as 2016 or as late as 2020. It takes roughly seven years - from site development to construction - to complete an NFL stadium. Atlanta, Ga. - Arthur Blank, owner of the Atlanta Falcons, expects it to take seven years for his efforts to build a new stadium to bear fruit. Blank says he expects to be the major financial backer of the venue, but that public money will be needed as well. Whatever happens, Blank said the Falcons need to play in a new stadium not only to keep their competitive edge but to help Atlanta maintain its image as a world-class city. Blank has said previously that he wants a new stadium when the bonds sold to the Georgia Dome are paid off, probably around 2015 to 2020. He mentioned that the team's lease of the state-owned facility expires in 2020 or when the bonds are paid. "The Falcons are falling behind other teams in the NFL in terms of the experience for our fans," Blank said at the Atlanta Press Club. 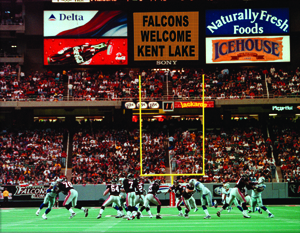 The Falcons started playing in the Georgia Dome in 1992. Since that time, 25 NFL teams have gotten new stadiums, Blank said. He's concerned that the franchise's competitive edge is waning without a modern-looking home. The stadium could have a retractable roof and cost approximately $1 billion. Atlanta, Ga. - The Georgia World Congress Center Authority agreed to pay Kansas City-based Populous architects $145,000 to propose a master plan for the Georgia Dome. The company's conclusions could be available as early as early spring. The decision to study the Dome's future comes on the heels of continued speculation that the Atlanta Falcons, who have called the stadium home since it was completed in 1992, could possibly move away from downtown. Dan Graveline, executive director of the Georgia World Congress Center, told authority board members that the Populous study would look at the merits of renovating the current Dome or building a new stadium. Populous has already looked at the Dome's future in an overall master plan study it conducted for the GWCCA last year that weighed the entire campus, including the construction of a new wing for the convention center. But this study would focus more intently on the Dome to give the authority and the Falcons a more complete look at the building's tangibles. It will take into consideration building a new dome, an open-air arena or having a retractable roof. It also will look at the cost of gutting the current building and starting over. Atlanta, Ga. - The new head of the Georgia World Congress Center says he wants to keep the Atlanta Falcons downtown. The team has been working on long-term plans to build a new stadium. Frank Poe went to Atlanta after six years as head of the Dallas Convention Center. He said Dallas made the same mistake twice when it passed on bringing the Cowboys football franchise within the city limits because of concerns over public funding. The result: The millions in revenue the team attracts has gone into the coffers of Irving, Texas, and more recently to Arlington, Texas, the new home of Cowboys owner Jerry Jones' billion-dollar-plus stadium. Poe made the comments after attending his first meeting of the GWCC authority. The authority oversees operations of the convention center - the fourth largest in the nation - as well as the Georgia Dome and nearby Centennial Olympic Park. The authority is studying options for expanding the Dome or building a new facility to take its place in an effort to keep the Falcons downtown. The move is a response to reports that owner Arthur Blank is open to the idea of moving the team outside the city limits. A bill to extend the expiration of Fulton County's hotel/motel tax - which is used to retire the bonds on the almost 20-year-old Dome - from the current 2020 to 2050 passed the Georgia House earlier this month. It's now being considered by the Senate. The Dome has proved to be a money maker for the state, especially as the Congress Center has struggled. GWCC leaders said the convention center was $3.6 million in the hole against budget in February. The Dome, on the other hand, amassed a profit of about $19 million during the same period. Poe said he is encouraged by the legislature's actions to retain the Falcons in their current home. The Georgia Senate has approved legislation that could eventually help fund a new stadium for the Atlanta Falcons. The bill makes it possible to extend hotel/motel taxes at the Georgia Dome from 2020 to 2045 if the Falcons agree to remain on the World Congress Center campus. The team has been considering sites outside the city. The bill has been approved by the House, but has to go back for another vote because of amendments made to the language. Atlanta, Ga. - The Atlanta Falcons say planning for a new stadium is leading them to serious consider an open-air venue. The team also hopes to remain downtown near the Georgia World Congress Center and their current home, the Georgia Dome. The Falcons' desire for autumn skies overhead could clash with the some of the Georgia Dome's biggest moneymakers, each of which prefer to play indoors. In addition to the Falcons, the Dome also is home to the Chick-fil-A Bowl and the SEC football championship, noted Frank Poe, executive director of the GWCC, which oversees operations of the state-owned Dome. The facility has also been the site of two Super Bowls and several Final Four basketball championships, and it is used for variety of other events. To host such events and satisfy the Falcons, the GWCC would have to operate both a new stadium and the Dome, a situation that could stretch GWCC resources thin, Poe said. The comments, from Rich McKay, the football team's president, were the first time an official for the team has talked about management's preferences for a new home. The team and the GWCC have been looking for months at options including renovating the current Dome, or building a new dome, an open-air facility or a retractable-roof stadium. McKay said a retractable roof is too costly, while renovating the Dome would not provide a state-of-the-art facility for the long term. Officials with the team recently began privately briefing key city and civic leaders about its plans. The Dome, though updated several times since its construction, is becoming one of the oldest stadiums in the league. Discussions about the team's digs intensified over the past few months as the Georgia legislature passed a bill extending the hotel-motel tax for the Dome until 2045. Money for a new stadium would come from the tax and a contribution by the Falcons. The amount from each is to be negotiated, as is the division of revenue from concessions, parking and other sources. GWCC officials, meanwhile, have commissioned a study, due this summer, looking at updating the Dome. A second phase will look at whether the Dome should be replaced with a new one, an open-air field or one with a retractable roof, Poe said. If a plausible downtown site is not found, the Falcons may yet look elsewhere, McKay said. McKay said ground breaking could be as soon as late 2012 if a deal is struck from current talks. Atlanta, Ga. - Georgia World Congress Center officials are studying the possible future of the Georgia Dome if the Falcons left for a new venue. GWCC executive director Frank Poe has said he doesn't want to give up on the lucrative Dome because it has financial significance beyond the Falcons. It's home to the Chick-fil-A Bowl, has become a favorite for SEC football championships and has lured NCAA Men's and Women's Final Four tournaments. And many events with which the Dome has contracts will only play in a stadium with a roof, including the several basketball tournaments the facility is committed to host through 2015. The Georgia Dome also is part of the bid to bring the World Cup to Atlanta in either 2018 or 2022. But Poe acknowledges that a big chunk of the facility's operating revenue - as much as 52 percent - comes from the Falcons. The Falcons brought in $8 million in revenues during the 2009 season, which included eight regular and two pre-season games, according to Dome figures. The GWCC adds to that Falcons revenue figure the roughly $17 million to $19 million collected annually from a hotel/motel tax levied to pay off Dome bonds. "We are going to go through this in a deliberative and expeditious fashion," Poe said of the work to determine future plans for the Dome and the Falcons. "I wouldn't say that there is a forgone conclusion that there will be two stadiums. I'd say we are at the front end of this, not the back end. It's going to take time." What Poe has to consider is how to make the numbers work. For instance, the Dome's operating budget for fiscal 2011, which begins July 1, is $55 million. Expenses will total around $41.3 million. The net profit - some $13.6 million - will come largely from the Falcons. Take that away and what does that leave. Poe hopes the answer may be in new business. Fiscal 2011 will be aided by new revenue from the Georgia State University Panthers, playing their inaugural season at the Dome, as well as WWE's Wrestlemania 27, considered to be the Super Bowl of wrestling. Supporters of a World Cup bid in the city also hope to bring more soccer to the stadium as a way to show the area's interest in the sport. In fact, while the Falcons played 10 games at the Dome in 2009, the facility hosted a total of 106 events that year. And the Top 10 events in the stadium so far in fiscal 2010 - excluding Falcons games - brought in $6.4 million, including the U2 concert, Monster Jam, Supercross and Honda Battle of the Bands. "The business model of the Dome would change certainly in the hypothetical event of the Falcons moving out," he said. "There is not a quick and easy answer." Atlanta, Ga. - Investing $549 million in a new roof for the Georgia Dome and expanding the venue could result in more revenue, according to an architect's study reviewed by the Atlanta Journal-Constitution. A retractable roof and more space would allow for more club seats and parking spaces, both of which would generate more money. The report also suggested naming rights as another possible revenue source. The study, done by Populous architects, envisions expanding the Dome to 1.8 million square feet, up from the current 1.6 million square footage. That would make it about the same size as competing stadiums, but about 800,000 square feet smaller than the billion-dollar Dallas Cowboys facility that opened last year. The newspaper said the roof alone would cost about $200 million. Other expenses, including design, could nearly double the $549 million estimated expense. The Georgia World Congress Authority released the report, providing the first indication of the GWCCA's position since Falcons executives said in May that they prefer a new open-air stadium for their next home field. The Falcons leadership also said they want to stay downtown on the GWCC campus. GWCC and Falcons officials have been in talks about alternatives ranging from modifications to the Dome to a retractable-roof or open-air stadium, the newspaper said. The report is intended to establish a baseline for discussion about the future of the Dome, including whether it would remain in operation if the Falcons move to a new stadium, GWCCA officials said. The next step is to discuss the report with all Dome users, determine agreed-upon areas of improvement needs, assess costs and fine-tune the recommendations. GWCCA Executive Director Frank Poe told the newspaper there is no timeline for work. Falcons President Rich McKay told the newspaper in May that a retractable roof stadium would be too expensive, while renovation of the Dome would not give the Falcons the state-of-the-art facility they seek. The report does not address the option of a new stadium or how that would affect the Dome. The GWCC commissioned the study last year, long before the Falcons made public their preference for an open-air stadium, the newspaper said. "Its focus is specifically on the upgrades or renovation opportunities associated with the Georgia Dome," Poe said. "It does not stray off of that path". "The charge of their report was to assess what could be done to bring the Georgia Dome up to current NFL standards taking into consideration comments from the Falcons and our key customers," he said. In considering the Falcons' desire for an open-air home field, the GWCC has to consider the effect on Dome events such as the Chick-fil-A Bowl and SEC championship game, as well as non-football events, the newspaper said. In an effort to keep the Falcons downtown, the state legislature this winter passed an extension of the hotel-motel tax used to pay down debt on the Dome, which was built in 1992. That tax expires in 2020, but the extension will keep collections rolling to 2050 to be used for any expansion of the Dome or a new facility. The extension only applies to facilities that are on the GWCC campus, however. Atlanta, Ga. - NFL commissioner Roger Goodell is promoting a new stadium for the Atlanta Falcons and has suggested that it could be the future site of a Super Bowl, the Atlanta Journal- Constitution reported. The team and the Georgia World Congress Center Authority, which operates the stadium are in talks about the team's future. The team's lease does not expire until 2020. "Both sides are committed to reaching an agreement that serves the best interests of the community, our fans and other stakeholders involved," Kim Shreckengost, executive vice president and chief of staff for the Arthur M. Blank Foundation, told the newspaper. Blank is owner of the Falcons. The Falcons say they prefer an open-air stadium while GWCCA leaders commissioned a study that looked at alternatives to a new field, including expanding the Dome and adding a retractable roof. Falcons President Rich McKay said in June a retractable-roof stadium would be too expensive, while renovation of the Dome would not give the Falcons the state-of-the-art facility they seek. Discussions are further complicated by the Dome's other clients, such as the Chick-fil-A Bowl and the SEC, which has held its annual football championship game in the Dome since 1994. Each prefers to play inside, which forces leaders to consider operating and filling two facilities simultaneously. The NCAA Final Four as well as the SEC and ACC basketball tournaments have also used the Dome for their signature events. The Journal-Constitution said the Georgia legislature this year agreed to extend the hotel/motel taxes, currently dedicated to payment of debt on the $214 million Dome, to a possible new stadium. Under the deal, the collections, which are to sunset in 2020, would be extended to 2050. "The lease between the Georgia Dome and the Falcons will end in 2020 unless the revenue bonds are paid off sooner," GWCCA Executive Director Frank Poe told the newspaper. "It would be speculation to try and determine early pay-off dates. Early pay-off depends on many elements to include revenue generated in the future, hotel/motel tax generated, etc." The collections will be used to pay down the debt, but will be aided also by revenue brought in from parking, concessions and advertising. Boosters of a new stadium contend that it keeps the city competitive with other NFL cities that are currently building bigger and more modern stadiums, such as the $1.2 billion Cowboys Stadium in Dallas. A new facility won't cost taxpayers, the newspaper said, because it will be paid for visitors through the hotel/motel taxes and will attract big events, foremost among them the Super Bowl. The last time Atlanta hosted the nation's most-watched sporting event in 2000, the Bowl had a reported economic impact of $292 million. Plus, boosters say, an open-air stadium could be used for soccer, giving Atlanta access to hosting world's most played sport. Atlanta is part of a U.S. bid to land the World Cup in 2022. The newspaper quotes critics who say that new stadiums are all about owners gaining a bigger piece of revenue, not what's best for a city or taxpayers. In the NFL, ticket revenue is set at 40 percent for the visiting team and 60 percent for the home team, Victor Matheson, a professor of economics at the College of the Holy Cross in Worcester, Mass., told the Journal-Constitution. Team owners generate more money by finding new revenue streams from suites, concessions and parking, he said. Building a new stadium allows the owner to shape where the money goes. In fiscal 2009, the Dome had revenue of $31 million, according to the GWCCA. A total $16.6 million went to the Falcons, while the Dome kept. $14.3 million for operations and to pay down debt. The Falcons share in revenue of all Dome events, not just their games, Mark Geiger, a spokesman for the GWCCA, told the newspaper. It also gets a share of proceeds from events like concerts, conventions and other sports activities. Atlanta, Ga. - The Georgia World Congress Center Authority has agreed to enter into a "memorandum of understanding" with the Falcons on plans for a potential $700 million open-air stadium downtown, the Atlanta Journal Constitution reported. But the newspaper said the Falcons have made it clear that they want a new open-air stadium, rejecting alternatives such as expanding the Georgia Dome, adding a retractable roof to the facility or building a new dome with a retractable roof. A new stadium could open as soon as 2017, officials said, and would be built on a site just over a half-mile north of the Georgia Dome. "We appreciate the Authority's diligence in working through this process in a thorough and thoughtful manner," the Falcons said in a statement. "We continue to have open dialogue with the Authority on a range of topics and options, with the shared goal of working toward an agreement that is in the best interests of the community, our fans and all other stakeholders involved. At this point, no decisions have been made; therefore, we will have no further public comment at this time." The action was the first time the GWCCA committed to actively plan for the Falcons' future, not just study stadium alternatives. The next step, officials told the Journal Constitution , will be for Falcons and GWCCA leaders firm up plans for the facility, iron out revenue sharing, work out how much the state and the Falcons will pay toward construction and determine lease terms. The Authority, a state agency that operates the Dome, approved the agreement after Kansas City-based architecture firm Populous, which has been studying future plans for the Congress Center and its relationship with the Falcons, delivered its look at the viability of an open-air stadium. The firm said a new stadium could fit on the Congress Center's Marshaling Field - an area where trucks are parked during conventions. The stadium would have 65,000 permanent seats, 10,000 temporary seats, 7,500 club seats and 110 luxury suites. Walkways would be constructed over the streets for pedestrians, who would face a much longer trek from the nearest MARTA rail station than they have now to the Georgia Dome. The plan would leave the Georgia Dome standing. GWCCA officials have argued that they would lose money if the facility, built in 1992, was torn down. Big tournaments such as the SEC football championship, the Chick-fil-A Bowl and the Men's Final Four and ACC basketball championships have all played at the Dome because they prefer an enclosed stadium. The state last year helped any potential agreement between the GWCCA and the Falcons clear its first hurdle when the General Assembly approved extending the bonds paying off the Dome. Those bonds, being paid off with hotel/motel tax collections, were to sunset in 2020, but will now end in 2050. The Falcons, in return, have agreed to stay downtown on the GWCCA campus, the newspaper said. Atlanta, Ga. - The Atlanta Journal Constitution says a new stadium would benefit the Falcons, but sources it interviewed said it might not provide as much benefit to the community. "Economists have studied the economic impact of stadiums to death, and the clear consensus is that there is no positive impact," said author and sports economist J.C. Bradbury of Kennesaw State University. "Economists don't agree on a lot, but right wing, left wing, they all agree on that." And this wouldn't even be a new team, just a shift of Falcons games from the 19-year-old Georgia Dome to a stadium that would be built on nearby Ivan Allen Boulevard. "It's just adding zero to zero," Bradbury said. Many options are still on the table - perhaps including renovation or expansion of the Georgia Dome, where the Falcons now play. The Georgia World Congress Center Authority has drafted a "memorandum of understanding" on plans for a $700 million stadium. If they reach a formal agreement, officials said, the state or the authority would issue bonds to raise $350 million to $400 million, while the team would cover the rest of the cost. Falcons owner Arthur Blank bought the team for $545 million in 2002 and is now said to be seeking a better revenue-sharing agreement with the authority, the newspaper said. A new stadium would provide the Falcons a more lucrative arrangement of luxury boxes, club seats and preferred seating, such as placement on the 50-yard line. Unlike money from television contracts, much of the revenue from a stadium does not have to be shared with other National Football League clubs. "The team gets to keep the lion's share of local revenue. That's why they want a new stadium," said Dennis Howard, professor of business at the University of Oregon and an expert on sports financing. "My question would be, 'What's in it for the state of Georgia? What's in it for the city of Atlanta?'" Kansas-based architecture firm Populous released its findings recently on the possibility of a new stadium, bringing to an end two years of studies on ways to keep the Falcons downtown. The GWCCA, which oversees operations of the Georgia Dome, hired Populous in 2009 at a cost of $145,000 to propose a master plan for the Dome. When the Falcons made it clear they preferred an outdoor stadium, the firm's directive was broadened to consider a retractable roof for the Dome and new stadiums, one with a retractable roof and the other open-air. The effort got a boost when the state Legislature agreed in 2010 to extend the hotel and motel taxes used to pay off the bonds for the Dome to 2050. The bonds were to expire in 2020. Atlanta, Ga. - The Georgia World Congress Center Authority will conduct an economic impact study on how a new open-air football stadium for the Atlanta Falcons would affect communities around Northside Drive in downtown Atlanta, the Atlanta Journal-Constitution reported. Area residents pushed for the study because they want to avoid duplicating a Turner Field-type development in which a new stadium is surrounded by parking lots and not much else, the newspaper said. They argue that communities along Northside Drive, specifically Vine City and English Avenue, have already been cut off from downtown by a "super block" that houses the Georgia Dome, the Georgia World Congress Center convention facility and acres of parking devoted to each. That has some areas with fewer restaurants, hotels and retail outlets than other parts of the city. Building a stadium on what is now the Marshaling Field for convention vehicles would only worsen the situation if the effect on the area isn't considered, they said. The GWCCA, a state agency, and the Falcons are in talks to either build a new $700 million stadium on the Marshaling Field or to expand the Georgia Dome, the football team's current home. The newspaper said the Falcons have made it clear the team wants a new open-air facility. The suggestion of a new stadium has raised questions about the need for an updated facility, who will pay for it and how it will effect downtown. The state would issue bonds to raise $350 million to $400 million for the stadium, while the team would cover the rest of the cost. The impact study would be done after the two parties decide whether to build a new stadium or expand the Dome, Frank Poe, GWCCA executive director, told the Journal-Constitution. He did not know how much the study would cost. Atlanta, Ga. - The Atlanta Falcons' desired open-air stadium might wind up with a retractable roof if ongoing negotiations get bogged down, according to the Atlanta Journal-Constitution. While both the Falcons and the Georgia World Congress Center Authority say the focus remains on trying to reach a deal that would put the team in an outdoor stadium and preserve the nearby Georgia Dome for indoor events, neither side shuts the door on the option of an indoor/outdoor, retractable-roof facility. That option would be much more expensive, could make the Dome unneeded and would represent a change in stance for the Falcons, who have expressed a preference for an open-air stadium without the added cost of a retractable roof. A Georgia legislator briefed on the negotiations between the GWCC Authority, which oversees the state-owned complex that includes the Georgia Dome, and the Falcons told the Journal-Constitution that a new stadium with a retractable roof and a natural grass playing surface is among the options being considered. Another person familiar with the negotiations said a retractable roof could be pursued if it is determined that two stadiums - the Dome plus a new open-air facility - on GWCC property are not financially or logistically viable. Asked for the Falcons' current position, team president Rich McKay said in an email: "A retractable roof stadium has always been one of the options, but our first preference has been to focus on an open-air stadium." That remains the focus of talks between the Falcons and the GWCC, according to both parties. If an open-air stadium is built as the Falcons' new home, the Georgia Dome would remain needed for events that require an indoor facility, such as the SEC football championship game, the Chick-fil-A Bowl and the NCAA basketball Final Four. But if a new retractable-roof stadium were built, it could accommodate those events by closing the roof and could signal the demise of the Dome. When the Falcons and the GWCC Authority began exploring the stadium issue several years ago, three options were kicked around: a remade Georgia Dome, a new open-air stadium, and a new retractable-roof stadium. The GWCC Authority commissioned a feasibility study in 2010 that looked at the option of renovating the Georgia Dome and giving it a retractable roof. Although the idea has not been ruled out, the Falcons have made clear their desire to move into a new, more lucrative stadium when Georgia Dome bonds are paid off later this decade. A subsequent GWCC-commissioned feasibility study looked at building an open-air stadium on GWCC property about a half-mile north of the Dome. The study pegged the cost at around $700 million. A feasibility study has not been done on a new retractable-roof stadium. The GWCC Authority agreed a year ago to enter negotiations with the Falcons toward a possible memorandum of understanding on a stadium, which the team has described as a public-private partnership. Some funding would come from a continuation of the hotel-motel tax and some from the Falcons, but potential details have not been spelled out publicly. Representatives of the Falcons and the GWCC Authority have met at least monthly for the past year and continue to do so. Poe has said that a major challenge has been finding a deal that would work for a new stadium and keep the Dome a "sustainable and viable" entity. 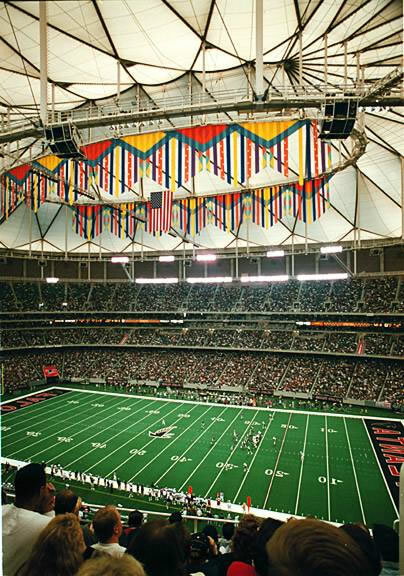 The Falcons are committed to playing in the Dome, which opened in 1992, until the bonds on the building are paid off. That is scheduled to be 2020 but likely will occur sooner, perhaps as early as 2017. Atlanta, Ga. - In what the Atlanta Journal Constitution said was a significant shift in the discussions about a proposed new home for the Atlanta Falcons, the team and the Georgia World Congress Center Authority are trying to work out a deal that would result in building a retractable-roof stadium downtown and demolishing the Georgia Dome. The new plan comes with a higher price. A GWCC-commissioned study put the cost of a new retractable-roof stadium at $947.7 million, up from the $700 million estimated last year for an open-air stadium. Under either plan the public-sector contribution would be an estimated $300 million from an extension of the hotel-motel occupancy tax, passed by the Georgia Legislature in 2010, according to Frank Poe, executive director of the GWCC Authority, the state agency that operates the Dome. Poe and Falcons president Rich McKay, who jointly revealed the new direction in negotiations, said substantial progress has been made toward a deal but that much work remains to be done. The Falcons want a new stadium because they feel the Dome, which opened in 1992, does not offer the premium seating and other amenities that drive revenue in more recent NFL stadiums. Among the many issues still to be resolved: the site. In addition to a previously disclosed site one-half mile north of the Georgia Dome � a site that currently contains a GWCC parking lot and a truck-marshaling yard � Poe said another site just south of the Dome is under examination. Poe and McKay said it's too early to know if the second site is a viable alternative. The turn in talks toward a retractable-roof stadium means the Falcons' original preference of an open-air facility, which would have been home to the NFL team while the Dome continued to house events that required an indoor facility, is off the table. While an indoor/outdoor, retractable-roof facility would make the Dome unneeded, Poe acknowledged "it's a valid concern" how the public will react to the idea of demolishing a stadium that opened just 20 years ago. "Part of our analysis is what do we do with the footprint that the Georgia Dome currently occupies and how to repurpose that space, whether it be in the form of commercial development or some development attendant to the Congress Center," Poe said. The Falcons' lease commitment to the Dome expires when the bonds that funded the building's construction are paid off later this decade. Beyond the hotel-motel tax, neither Poe nor McKay would provide specifics on how the proposed stadium would be paid for. Asked if Falcons owner Arthur Blank is prepared to cover the roughly $650 million difference between the estimated hotel-motel tax contribution and the new cost estimate, McKay said only: "I think we have negotiated enough to understand what we think the financing plan would look like, and I think we would be prepared to make a deal on those terms." Said Poe: "Our board is certainly committed to ensure we work very hard and deliberatively to try to get a business deal that makes sense for the state and certainly understands some of the needs of the Falcons." The GWCC Authority and the Falcons commissioned a study by Kansas City-based architecture firm Populous to examine whether a single-stadium solution might be achieved by transforming the Dome into a massively renovated, retractable-roof stadium. The study shot down that idea. The study said that if the Dome were expanded and rebuilt to provide the amenities sought, the new seating capacity would fall short of the minimum required for Falcons games and special events. The report noted that use of the Dome would be severely interrupted during such a project. Also, the study contended that redeveloping the Dome with a retractable roof would cost $859.3 million, $88.4 million less than the $947.7 million cost of building new on a nearby site. Populous called that "not a compelling difference," adding in the report: "Based on our experience in encountering unexpected conditions in existing stadium demolition and reconstruction, the cost differential ... is more likely to narrow than expand." The study also included projections on costs associated with the proposed new retractable-roof stadium. The big reasons for the jump in total cost, compared with last year's estimate of $700 million for an open-air stadium: $183.6 million for a retractable roof, $8.2 million to demolish the Dome if a retractable-roof stadium is built and updating all other costs from 2011 to 2014 dollars. "One of the concerns we had with a retractable-roof solution was cost," McKay said. "We have come to understand that to make a deal that is in the best interests of all the stakeholders, that is the best alternative for a 30-year solution. ... We understand that ups the cost, and that principally will fall on our side of the ledger." If a deal is reached, the Falcons hope construction will begin in 2014 and that they will play in the new stadium in 2017.